Our Cross Docking Center is conveniently located one and a half miles South of I-94, on Highway 29 South. We are able to accommodate your various needs of Cross Docking. Whether it is a full or partial load, we have the capability to store many different kinds of products. 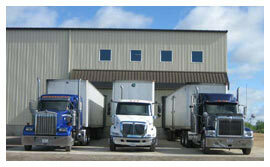 Warehouse storage or trailer to trailer transfers are available. We accept trucks by appointment or even in case of emergency from break downs or a lack of driving hours available. Simply call ahead so we can prepare for your arrival.